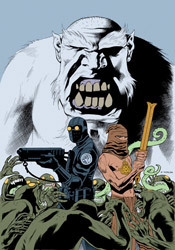 Spinning out of the pages of Hellboy comes BPRD, an ongoing account of the adventurous organization who provides our last line of defense in the battle against the occult, the paranormal and the just plain unknown. Perfectly willing to fight fire with fire, the Bureau itself retains the services of a number of friendly supernatural beings, including but not limited to demons, amphibious men, telekinetics and pyrokinetics. This time the international organization is on the case of Martin Gilfryd, a museum curator from the early 1900s whose fascination with Eastern folklore bordered a bit too closely on the unhealthy. Reborn in the present as Memnan Saa, the legendary master of fire and dragons, Gilfryd has already proven to be more of a threat than any member of the Bureau could have predicted. Though Hellboy himself doesn't make an appearance this month, writers Mike Mignola and John Arcudi pack the issue with the same sense of curious adventurism and jolting action that have come to characterize the big red guy's escapades. Something I've always admired about Mignola's writing is his ability to effortlessly intertwine fact with fiction with folklore, blurring the lines between the three and convincing his audience that what they're witnessing, no matter how unbelievable, is actually rooted somewhat in reality. Although the peak of the fairy tale is more than a generation behind us, the books in the Hellboy family have done everything in their power to remind us of what we found so endearing with them in the first place. The marriage they provide between the limitless possibilities of those old yarns and the factual basis, strong characterization and stunning visuals demanded by modern readers is one of a kind. The Black Goddess draws from that same pool, and if that hasn't grown old by now I can't imagine it ever will. Industry veteran Guy Davis continues to provide BPRD's artwork, bringing with him a style that's at the very least reminiscent of Mignola's simple, unmistakable work with the characters. And though Davis's efforts are inarguably simple and technically sound, he really doesn't benefit from that natural comparison, no matter how unfair that may be. He lacks the fine control of Mignola; his compositions seem more uncertain and free-flowing. While that looser take works to his benefit on a few occasions this month, particularly when the narrative shifts to look back at the path that led Gilfryd to become the Memnan Saa, it doesn't always fare so well. His work has trouble with facial expressions (faces in general, actually), and really isn't the best way to depict an enormous battle scene. Davis is playing the right song; he's just a hair out of tune. Still, the Black Goddess is just what you think it is. Mignola's universe continues to impress me with its versatility and uncompromising high quality, which is amazing considering how long it's been around. As long as there remain unexplored myths and legends somewhere in the world, the BPRD will be around to investigate their origins and cast new light on an old subject. Although the series could do with a tad more consistency in its artwork and you'll want to read the preceding two issues before bothering with this one, it's still worth your time. Borrow it.